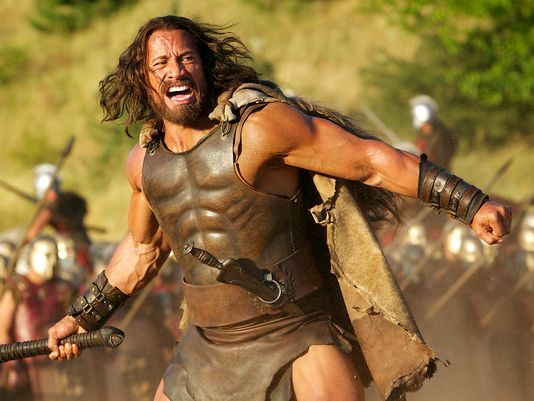 Dwayne Johnson Touts Hercules at CinemaCon | Radical Studios, Inc.Radical Studios, Inc. The Rock himself, Dwayne Johnson, was at CinemaCon today to promote his upcoming adventure epic Hercules wherein he plays the mythological hero. The new trailer, seen below, debuted online today, but Johnson screened it for IGN and other members of the invited press Monday at a Paramount Pictures brunch, during which time he also participated in a Q&A. 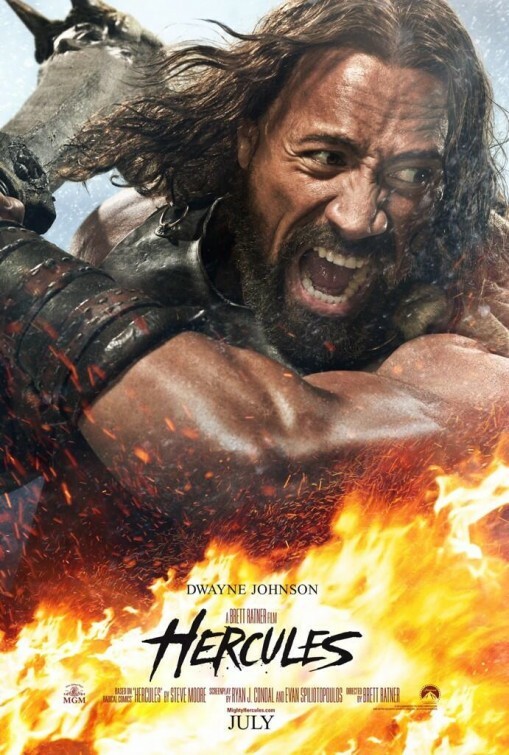 Dwayne Johnson stars as Hercules. Question: I’m very curious about the balance between playing it real versus fantasy. Is it like 300 exaggeration? 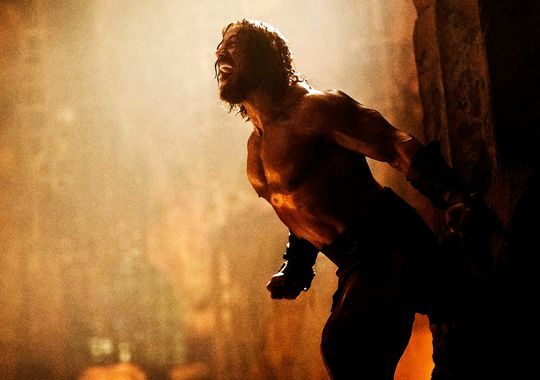 Dwayne Johnson: Well, there had been a few iterations in the past of Hercules. The idea was to take the spirit of the graphic novel, which we liked, and then create a script and a story based on that that still gave a very unique twist on the story of Hercules. But we also pay attention, respect and homage to the mythology of Hercules as it relates to the 12 Labors and the group that Hercules had around him, the anguish that he had to go through with the death of his family and things like that. So the goal was to strike a nice balance between, again, a unique twist on the story, and yet at the same time make sure that we still paid homage to the mythology of Hercules. Question: Since Hercules is public domain, what is it about the graphic novel that made it so specific that you guys wanted to go for that version? Johnson: You know what it was? It was taking a lot of elements of the mythology, of Hercules, and tweaking them, where ultimately at the end, the greatest thing Hercules can accomplish is accepting his fate and his faith. His faith then becomes his most powerful asset. A lot of times in the past there was — you know, we didn’t want to rely completely on the fables and fantasy elements. We wanted to have some roots being grounded in something. We all felt, by the way, that we were able to strike the balance correctly, where we still paid homage to the Labors and the story of Hercules, but we also made sure that it was really rooted and grounded in something that was very real and something that was palpable to us, today. That palpability would be, you find great power when you have faith — and not necessarily a religious faith, but just the faith in that things can be better. Question: What about Hercules’s lineage and the fact that his father is a god? Are you going to continue that, about Zeus and all that stuff, or do you have to stay away from that? Johnson: Buddy, no! [Laughs] Yeah, absolutely, yeah… You know what happens? When we first meet this version of Hercules, he’s gone through a tremendous amount of trauma and anguish over the fact that he’d murdered his family. So when we see him and he’s introduced in this story, he doesn’t care about his faith, and he doesn’t care about who he is, who everyone claims him to be. It doesn’t matter to him, because he doesn’t have his family. Question: I think I saw Hydra and Cerberus and the lion, obviously. What other monsters are we going to see? Are they all rooted in his history? Johnson: Well, yes, in the 12 Labors? Johnson: Yes, we see most of them, and the other ones we know he accomplished. So basically, yes, when we see Hercules now, he’s already accomplished these 12 Labors. He’s accomplished them. You see the footage of that, of him doing it. So there’s a few that we didn’t actually see, like the Belt of Hippolyte. Question: What is the tone of this film? Is it completely a strict drama? Do you have comedic elements in it? That is something you bring to your projects sometimes. Johnson: The tone is a nice, even balance. I think of Gladiator and 300. There’s also personality in the movie. There’s fun. There’s some wink in the movie in a way that makes the audience feel good. Question: Is Hercules a completely strict guy and everyone around him is kind of a bit funnier, or do you have a few one-liners yourself? Johsnon: Yeah, a few one-liners, sure. I think that always makes it fun, trying to create a heroic character and putting your own twist on it and injecting your own personality into it. You know, the group of actors we had around, everybody came with their A game, all ready to make something that was really, really special. All the actors came on-board knowing that there was another Hercules already being made, knowing that there were other versions of Hercules in the past, in movies and on TV. So everyone got together and wanted to pay homage to the mythology and bring their unique twist. Question: For anybody who follows you on Twitter, can you talk a little bit about the revealing of the look of Hercules? That was something you guys kind of cloaked in mystery for awhile. Can you talk about the reasoning for that and the process of coming up with the look? Johnson: Well, the reasoning for that was to try and maintain the level of secrecy in terms of the reveal of what Hercules looked like. The reason for that was because it was going to be a complete transformation. For me, as you see me today, I showed up in Budapest like this, so the transformation was probably about three and a half hours a day. It started off at four and a half hours. We really had to — you just can’t make a movie when… [Laughs] Otherwise, the budget balloons. So in the idea of the complete transformation, we really wanted to do our best to make sure that it wasn’t revealed, especially if we knew that it was going to be as special — or at least we hoped it was going to be as special — as we could create it. So what we did was, they got the best wigmakers in Hollywood — in the world, by the way — and beard designers and beard-makers, Oscar winners, all helping to create the transformation. So that’s why it took so long. For example, the beard that I had was the full beard, and a lot of times in Hollywood, as you guys know, it’s a lace beard that we put on, and they take 30, 45 minutes, an hour tops. This took two and half hours — three hours, because we had very long strips of yak hair — really, yak hair — and they would cut them up probably and inch long and a quarter inch wide, and the process was, they would lay these on my face piece by piece by piece by piece. It was a very, very long process. But in that, what you get is something that is really spectacular. The first couple of days of camera testing and seeing it and recognizing, “Hey, we’ve got something really special. Let’s do our best to make sure that nothing is revealed.” So there was a strict mandate that there were no cameras on set. We fired tens upon tens upon tens of people throughout the process. I would say maybe close to 50 people were fired, crew members, all trying to sneak pictures. So there’s that. There’s mandate, and we all agree on that. But then I told the studio… those guys at Paramount [and MGM], I said, “Hey, what I’d like to do is take the audience and the fans on a journey from beginning to end, because it’s such a passion project for me. So from the time I get to Budapest, I’d like to take them on a journey in terms of what my diet is, what my training is and on set too.” They said, “Well, how are you going to do that?” I said, “Well, trust me. Somehow I’m going to do it.” So that’s how we came upon all the pictures, however we could do it, where I wasn’t necessarily showing my face, but giving the audience a taste of what it’s like on set and how things have been going. Question: With regard to the physicality, obviously, you know what you’re doing when it comes to preparing for roles. Johnson: I can fake it pretty good. Question: What was new on this one? A special jump or something, a sword something? Johnson: [Laughs] In the loin cloth, it’s an interesting jump. Well, in terms of the fighting style, I thought it was a very raw fighting style. That had a lot to do with club combat, because Hercules has his famous club. So that was a fun fighting style, because it didn’t involve any guns or a specialized fighting style other than he is just a vicious, raw man who is pretty good at what he does. Really, that’s it. But the training — not necessarily the fighting training, but the training in terms of gym training and things like that, that was a lot different than I had ever done. I trained harder for this role than I ever had before. You get one shot at Hercules, so it was about eight months of training, of prep, of fun mythology study, dialect coach, things like that. It was a very long process. Question: Did you do anything crazy like rip somebody’s head off or something else that you’d never done before? Johnson: Well, I’ve never ripped anybody’s head off — except in my dreams — but no, nothing, yeah. Question: What about Brett Ratner, because he’s not the most conventional director you’d think of for this kind of thing? Johnson: So there were a lot of directors who had their hands up — a lot of directors coming in at first. I thought Pete Berg was going to direct it. We had talked about that. Then we went in a different direction and met with a lot of different directors. Then we met with Brett. Brett came to the table very passionate about the project — as are all directors, by the way; they’re very passionate about the project — but I think the difference with Brett was that — and I’ve known Brett for a long time. I got a Brett at a very special time. What I mean by that is he has had great success, he’s been down, he’s gotten back up. It’s in that come-up that I was able to get Brett. He knew he had this incredible opportunity. He was very passionate about the project, very passionate about Hercules and very passionate about doing something that was very special. Also, I got a very hungry Brett Ratner. You guys have known Brett for a long time. You know he’s a great guy, he’s a talented guy, he’s a fun guy. It was good to see him at this level and raise his game. Question: Who was your Hercules growing up? Steve Reeves, Lou Ferrigno? Who was the character for you? Johnson: It was always Steve Reeves, yeah. That’s a great question. Always Steve Reeves. When I was a kid, I was always enamored by — I appreciated the movies, and I was able to see them on VHS when I was a kid, but I was so enamored by the one-sheets and the posters. I had them in my room when I was a kid. So yeah, it was always Steve Reeves. He’s the first one, you know? Question: Is there an homage to Steve Reeves in this? Johnson: That’s a good question. Well, you can’t match his looks, you know? Good-looking guy. [Laughs] No, other than just paying great respect. I appreciate Steve, because Steve, he was the very first Hercules and just a good-looking guy, movie star. Question: Was he an inspiration for you to get into bodybuilding? Question: You mentioned the raw combat style. What is the violence level of this film? Is it really brutal? Question: You mentioned all the work you put into the beard, and then we see you in the lion’s head. I’m just curious how much work you put into making that look real and authentic to the times, and how did it feel to finally wear that? Johnson: We have the best costume designers. Again, with a project like this, I was very happy to — at the time when we were putting this on its feet, I had G.I. Joe coming out, and then Pain & Gain, and then Fast & Furious; it was a long string of movies that I had coming out. So I was getting all these reports from our producers and the studio saying, “Hey, this is our DP,” “Hey, this is our set designer,” “Hey, this is our wardrobe designer.” They were all, again, award-winning designers. To answer your question, there was so much passion put into the design of the wardrobe and everything that was on set. So when you see the armor and the lion head, the club, it all looks very real and authentic. In Budapest, I took the club home with me every night back to the room, and the lion head. Question: Speaking of Pain & Gain, that was my favorite performance of yours. Question: Is there a difference in how you approach that kind of character versus how you approach a demigod like Hercules, or is it the same process for you coming into it? Johnson: It’s pretty much the same process, especially with those two characters, where they’re a bit heightened, and yet at the same time you still want to ground them in some reality and some humanity. There’s an empathy to them as well, because to compare both of those characters, I mean, they’re both big characters with a lot of things going on, and a lot of violence happening with both of these men. But yeah, it’s pretty much the same process. I have a specific set of tools that I like to continue to add to as the years progress and the movies progress, and then bring that to these characters. Question: There’s some pathos to that character in Pain & Gain. Is there that same kind of thing with Hercules, with his family? Do you bring that same sort of element in? Johnson: There is, yes. That’s a great comparison. I never drew the parallels until now, now that you’re talking about it, but yes. For me, as an actor and then going into Hercules, finding Hercules like this — this is why for me it’s been a passion project for 10 years. I’m so grateful that I didn’t make it when I first asked about it. I first asked about it when I came to Hollywood 14 years ago. I asked about Hercules and Walking Tall, but at that time I was actually shooting Scorpion King, so it was a little close. I’m happy I didn’t make it back then, because I couldn’t have brought I think the same weight and substance, just living as a man and having the experiences I’ve had today. So what I loved about this version of Hercules was that he was older, he was more experienced. When we meet him, he’s going through a lot of pain, and he has no family. His family’s been murdered. Question: Do you want to tell just one story as Hercules, or would you want to go through it all again and do another film? Johnson: Sure, sure. It all depends obviously on the box office and how much fans enjoy it. If they enjoy it, one of the cool qualities about Hercules is that the stories and the mythology of Hercules, they continue. They continue, where he teams up with Jason and the Argonauts. So there’s a lot of different ways we can go. Yeah, I’d love to. Sure. Question: Did you have any acting pals that begged to come on and do a cameo in this one or go into that world with you? Not that I want to see Mark Wahlberg as Jason. Johnson: [Laughs] Well, I’m not giving anything away, but there was a moment where — and we just couldn’t make the schedules align — it was going to me and Russell Crowe, and we were going to set something up. But that’s done with… Maybe down the road — but, you know, just to give you an idea of just how exciting and the different ways we can go. There are a lot of different characters that Hercules comes in contact with. Question: You filmed in Budapest. I’m curious if there were other places you considered for tax reasons about filming in another location, or was it always Budapest? Johnson: No, originally it was Romania — for tax benefits, and there was also sound stages there and things like that. Plus, Romania, there’s a great landscape there that can play very well. Didn’t work out in Romania. Then we brought our crew and gang over to Budapest, and Budapest ended up working extremely well. They had amazing sound stages there. Their landscape — there are parts of Budapest way out in the hills that look very survived, and it played very well for us. Question: I’m curious about the chronology of this story. You said we see some of the 12 Labors. Does the story proper take place after he’s done all the Labors? Is it like an in-between time? Johnson: Correct. When we meet him, he’s completed his Labors, and he’s also been exiled out of Athens by King Eurystheus. Now he just kills for money. But we do see the Labors, though. We make sure that we pay proper homage, again, to them. He has a multitude of flashbacks, including killing his family. Question: So have you seen a rough cut yet, or a final cut? Johnson: It’s not final yet, so we haven’t locked it yet, but yes, I’ve seen the rough cut. Question: So how does it compare, what you’ve seen thus far, to what you had envisioned going in? Does it exceed your expectations? Johnson: It’s everything I’d hoped it to be and more — because you never know with a movie like this. You never know with a movie this size and scope and a lot of different elements going on, where if you’re going to make it, you get one shot at it. It’s not like an action-comedy or an action movie that plays today, where you have a little bit of leeway, latitude, with what you shoot and what you can get away with. With something like this — epic in nature — it is Hercules, and he’s the world’s first superhero. There’ve been versions in the past, but we wanted to make the definitive Hercules. So going into it, there’s a lot of unpredictability. You hope that everyone comes with their A game, which they did. It was a very long shoot, man. Over six months, we were there — a lot of days, lot of long shoots, lot of long hours. You know, as you’re shooting it, it feels good to you, but you never know. You hope, and you have your gut sense, but in this case, yeah, it’s everything that I’d hoped it to be. The biggest thing for me was just making sure that, if the transformation was going to happen, it looked real and it felt real and authentic. It’s me in a wig — regardless if the wig took 40 days to actually make, the majority of them. Everything had to come together nicely, and I thought it did. Question: So is this a revenge-type thing, like, you’re trying to find the killers of your family? Was there a romantic element in this movie? Johnson: Let’s see… There was a romantic element with Ergenia, who was my wife until she was murdered — there went that romance! [Laughs] Maybe in the next one he’ll meet something. Is there a revenge aspect? Well, here’s the unique twist on it. One of the unique twists is that it starts off with anguish and pain, internally, then it becomes revenge when I find out who really killed my family. Question: Did anyone make you watch any of the Kellan Lutz Hercules? Johnson: ”Make me!” [Laughs] No, I actually didn’t see it, no. Did you guys see it? You had to see it.